into a cup for others to drink wine from. who doesn’t know what he’s about to do! This is an interesting poem by Rumi. The image of turning his skull “into a cup for others to drink from,” what do you think he means by this? In sacred traditions, the skull is often described as a bowl or a cup that receives the “liquid” of bliss — the Sufi’s “wine” or the yogi’s amrita. It is in the skull that this “wine” is first recognized, where it is first received. The skull seemingly lights up, from its base at the back of the neck around to the point between the eyebrows, and the entire inverted “cup” of the skull seems to fill up with a substance of immense life and joy. Rumi is receiving so generously of this divine drink that he is pouring it out for all to imbibe. And that “calm, intelligent man” is about to consume the wine and, in turn, the wine will consume him — completely. He is about to be drunk with the taste of the Beloved on his lips. Who knows what he’ll do then! He might just spin with ecstasy. I haven’t yet sketched out a short biography about Rumi. It always feels a bit foolish to try to distill a rich, full life into just a few paragraphs, but it’s especially difficult with Rumi since so much has been written about him and his life. Rumi was born in Balkh, Afghanistan. While he was still a child his family moved all the way to Konya in Asia Minor (Turkey). They moved to flee from Mongol invaders who were beginning to sweep into Central Asia. Konya, far to the west of the invaded territories, became one of the major destinations for expatriates to settle, turning the city into a cosmopolitan center of culture, education, and spirituality. In fact, Rumi wasn’t the only famous Sufi teacher living in Konya at the time. The best known spiritual figure in Konya at the time was not Rumi, but the son-in-law of the greatly respected Sufi philosopher ibn ‘Arabi. The wonderful Sufi poet Fakhruddin Iraqi also lived in Konya at the same time as Rumi. “Rumi” was not his proper name; it was more of a nickname. Rumi means literally “The Roman.” Why the Roman? Asia Minor (Turkey) was referred to as the land of the Rum, the Romans. The Byzantine Empire, which had only recently fallen, was still thought of as the old Eastern Roman Empire. Rumi was nicknamed the Roman because he lived in what was once the Eastern Roman Empire. …But not everyone calls him Rumi. In Afghanistan, where he was born, they call him Balkhi, “the man from Balkh,” to emphasize his birth in Afghanistan. Rumi’s father was himself a respected religious authority and spiritual teacher. Rumi was raised and educated to follow in his father’s footsteps. And, in fact, Rumi inherited his father’s religious school. But this was all along very traditional lines. Rumi was already a man with religious position when he first started to experience transcendent states of spiritual ecstasy. This created a radical upheaval, not only in himself, but also within his rather formal spiritual community as everyone tried to adjust to their leader’s transformation. One more note about Rumi’s father: It was only after his death that some of the father’s private writings were discovered, revealing that he himself was also a profound mystic, though he had kept this part of himself private, apparently even from his son Rumi. Many of Rumi’s poems make reference to the sun. This always has layered meaning for Rumi since he was deeply devoted to his spiritual teacher Shams of Tabriz… as the name Shams means “the sun.” The sun for Rumi becomes the radiance of God shining through his beloved teacher. The spiritual bond between Rumi and Shams was profound, but the two individuals were very different. Rumi was a member of the educated elite within the urban expatriate community, while Shams was a poor wandering mystic who rarely stayed in one place long. Shams would often disappear unexpectedly, then return months later. Many of Rumi’s family and students were jealous of Shams, resenting the closeness he shared with their master. Finally, Shams disappeared, never to return. Many believe that he was actually kidnapped and murdered, possibly by Rumi’s own sons! You’ve heard of “whirling dervishes,” right? 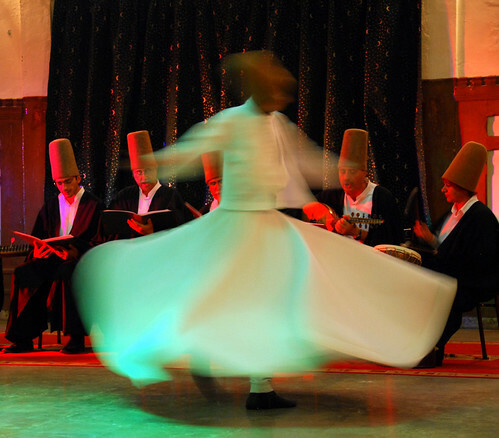 Not all Sufis practice that spinning meditative dance. That is specific to the Mevlana Sufis, founded by — yes, Mevlana Jelaluddin Rumi. The story is told that Rumi would circle around a column, while ecstatically reciting his poetry. The spinning is a meditation on many levels. It teaches stillness and centeredness in the midst of movement. One hand is kept raised to receive from heaven, the other hand is kept lowered to the earth, thus the individual becomes a bridge joining heaven and earth. I love Rumi. I’m no expert, but just from reading his work ( the Coleman Barks translations I find most accessible), I am always astounded at how relevant these hundreds of years old writings are to me, a woman in midlife living on the western edge of europe in the early years of the 21st century. He defies category. He uses wine as an image a lot. He clearly loved life and people. I imagine his skull full of ecstasy just bursting out to the world. Not even generosity, but an overflowing. Hmmmm, this one is a little too subtle to work out. Can’t make ‘ skulls or tails’ of it ,really, except maybe to ponder the contrast of opposites between the rational calm man and the one intoxicated with the taste of the Beloved, as you suggest. The very images & sounds of the words stay with me, though. Turning the hard death-like skull into a cup, chalice, grail flowing with ‘spirit’ may hold the key. speaks so beautifully to the day’s poem. For me the ‘match’ works very well. Thank you. And many thanks too, Ivan, for sharing your exciting new projects for Chaikhana Poetry. Makes me as a reader feel included and valued in the process. Blessings and strength as you move forward, step by step. The reference to drinking from the skull has to do with the Tibetan monk practice of leaving their skulls after death to be turned into wine cups for ritual sharing, as a reminder of the importance of cutting ties to the material body. At a meditation retreat I went to once, the lama passed wine in a skull for us to share at the end.